The year 2006 marked the 150th Anniversary of St. Louis Parish, Owensville in what was then called New Boston. 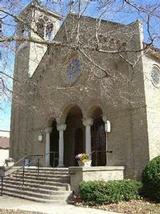 While the first church was built in 1857 and not dedicated until 1858, the first Baptism was recorded in December 1856. Since then, the church continues to cultivate a strong community bond with generations of families as parishioners. St. Louis parish has a rich and long history. Today, the parish numbers 450 families and growing. It has numerous spiritual, educational, and social activities.